Do you buy any auto insurance? Oh, you already do! It is indispensable when you drive a car. Next, how about travelers insurance? Well, it depends on your destinations. When you visit Japan, you wouldn’t have to buy costly insurance because of well-maintained public peace. Let’s come to the main point! When you get on Shinkansen or the Bullet Trains, do you also buy insurance? Eh? You need some time to think! Oh! What a waste! Japanese Shinkansen system is definitely risk-free. Please eat delicious Japanese cuisine for the insurance fee. In spite of a maximum speed of 320 kilometers per hour, Shinkansen keep beating its own record of no fatal accident since the opening in 1964. (Then the maximum was 210 kilometers per hour) It is an unbelievable but proud history. Please let me introduce the technology supporting the safest train system, the history and future of Shinkansen. Go! The Bullet Trains So Fast! Shinkansen to the right is an original type which is now retired. The left is a latest model. A maximum speed of 320 kilometers per hour would disturb you. “How bumpy are the train?” Don’t worry. You don’t feel little swing in the trains. For example, a paper cup filled with coffee is placed on a folded table. I bet it does not spill out! The vibration control devise of Shinkansen reaches an almost unimaginably level. Moreover, car interior always keeps clean. Reclining seats make you feel at home. Available are first-class cars called “Green-Car” for people with enough budget to spend. 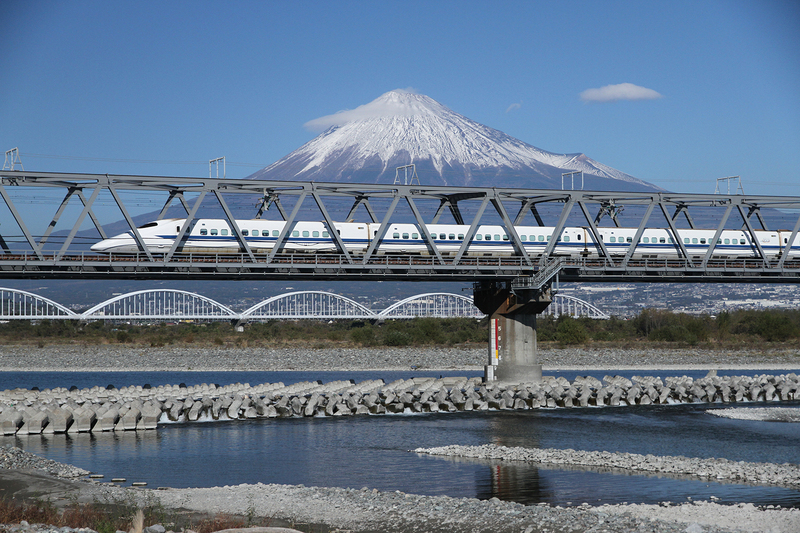 Although Shinkansen gives you a superb ride, one would like to feel a sense of speed. Only way to realize its velocity is to look at views from the window. In a blink of your eyes, views quickly change, change, and change which overwhelms you! Copyright © 2015 素材三昧 All Rights Reserved. 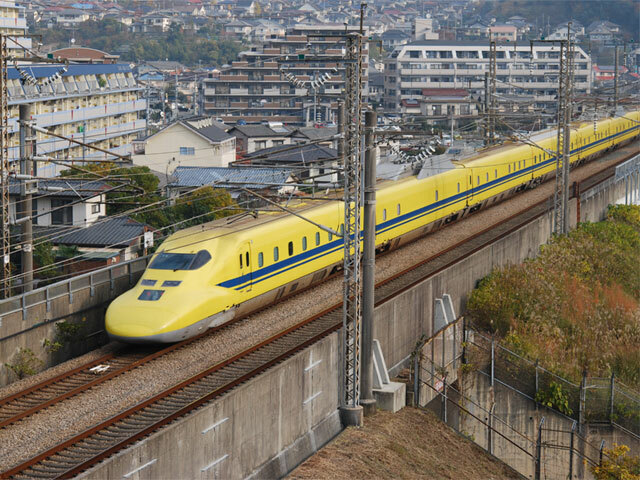 Yellow Shinkansen? In fact, this train is not design for carrying passengers. While running on the same track and at the same speed, it inspects all conditions of railway tracks, electric wires, high-power electric current, and railroad signals. Its nickname is Dr. Yellow specializing in Shinkansen. A wide variety of high-tech equipment is installed into the Doctor. He conducts a complete medical examination. Unfortunately, his doctor’s hours are secret. We can rarely meet him. For this reason, there is an interesting urban legend that we will be happy when we happen to see the Doctor. My explanations above mentioned are sure to persuade you to understand how safe the Shinkansen system is. Next, let me introduce the most important measure for safety which is indispensable for in-service trains. In some lines, detailed railroad timetable for Shinkansen is elaborately set up at 3-minute intervals. Shinkansen run according to the train operation diagram. This is the evidence that the punctuality is completely perfect. For reference, delay time in average is less than 1-minite. Of course, measures against unexpected happenings are sufficient. For example, if a Shinkansen came to standstill on a track, another train which comes from behind could not stop and collide when a motorman is in visual contact with the situation. Without a special devise, it would cause a catastrophe. To prevent such accidents, “Automatic Train Control Device” has been adopted since the opening of Shinkansen in 1964. The ATC system can automatically estimate allowable velocity in consideration of distance between a forgoing train and following train. And the permissible speed was transferred to a cab. When the speed of the latter surpasses its allowance, the train can automatically reduce the speed. Shinkansen is the integrated technology ensuring both safety and speed. Anyway, do you know how large Japan’s total land area is? Sorry, even few Japanese people know the accurate figure. It is smaller than that of Sweden and little larger than that of German. In terms of whole country area, Japan is an average nation. However, considering the distance not the total area, the Japanese Archipelago is long and thin from north to south. The distance from Hokkaido (a northern island) to Okinawa (a southern island) is almost the same as that from London to Moscow. Railway development takes advantage of this geography and population distribution. On October 1st 1964, nine days prior to the Tokyo Olympics, Shinkansen was first officially opened. However, when this new railway plan was brought forth and discussed, some people opposed it because they claimed that automobiles and airplanes would be a main means of transportations and railways were out of date. In spite of negative ideas, others had certain belief that railways were much suitable for Japan for the reason above mentioned. Soon after World War Ⅱ, Japan suffered from a lack of budget and even obtained financing from the World Bank to realize a dreamy super express. 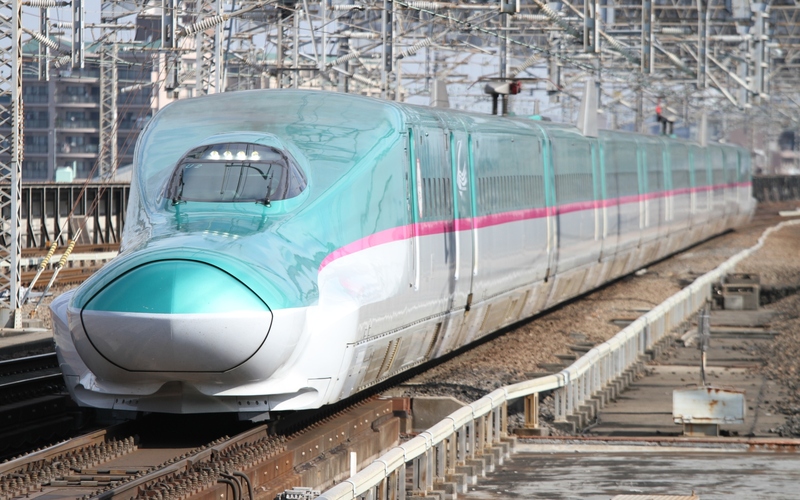 First Shinkansen line connects Tokyo, capital of Japan and Osaka, the biggest city of west Japan, and total distance is about 500-kilometers (310 miles). It is called the Tokaido Shinkansen line which is longer than the distance between London and Paris. Along the line, many cities, small or large, are strung together like beads. Shinkansen has commercially achieved great success! Today Shinkansen services cover most area of Japan, and in 2016 new line will extend to northern island Hokkaido through the longest undersea tunnel in the world. 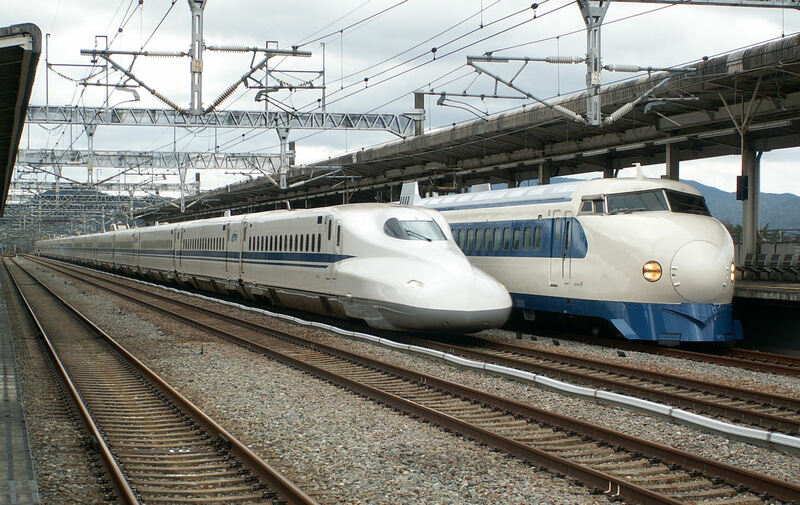 Like “Image 7”, Shinkansen will continue to extend in the future. It is in the world that Shinkansen will run! Railways are never out of date. 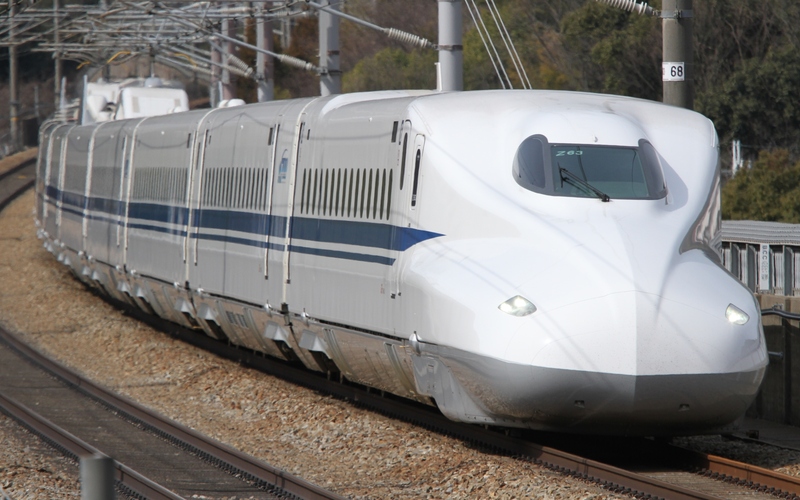 Since the success of Shinkansen, speeding up and innovation of trains has been developed worldwide. For example the TGV in France, while high-speed railways are revaluated, export competition of railway technology has grown intense. However, the Japanese Shinkansen system with no fatal accident for over 50 years from its opening is the best technology which has absolute requirements such as safety and punctuality. Someday, you will also get on a Shinkansen while viewing the Mediterranean Sea or the Rocky Mountains. Reference: http://jr-central.co.jp/news/release/nws001580.html in the explanation of “the ATC system”. Merry Christmas from Japan, but Is This a Real Christmas? Two Portuguese Changed Japanese Castles.